This technical information section is provided as a guideline to assist you in the safe and proper use of this new product. These guidelines should not be considered a complete guide but merely a starting point for successful implementation. It cannot be a complete guide because of the variety of machines, machining and programming techniques and component parts that we work with in our individual shops. For this reason, we encourage you to take a careful look at the way you integrate this technology into your manufacturing business. Swiss style screw machines that have live tooling capability were not designed to accomodate grinding processes. The live tooling in these machines was designed to drive small diameter drills and endmills. The horsepower that is available to drive these small diameter tools is perfectly adequate and generally perform without issue. However, grinding processes require more horsepower than drilling and milling operations. Also, larger diameter cutting tools, like the grinding wheels that we offer, require more horsepower to drive. It is for this reason that you must be very conscious of the feedrate and volume of material that you ask the grinding wheel to remove. Therefore, consideration must be given to several things, like live tool horsepower, diameter of stock, depth of cut and feedrate. The grinding wheel should always be run at maximum live tool RPM. This is a finishing tool and is not recommended for heavy stock removal. This tool must be run at the maximum RPM of the machine. This tool has been tested only on alloys of steel and is recommended only for that application at this time. Do not use this product on materials like Titanium until our testing is completed and our recommendations are made. This tool is not recommended for soft materials like aluminum and brass since testing has shown that these materials tend to load-up the grinding wheel. This tool works extremely well on hard, tough steel alloys. It performs well on heat treated steel well into the 60+ rockwell hardness range. This tool should not be used to grind carbide, however. The feedrate and depth of cut should be set such that the cutter RPM does not slow down noticeably when in use. A drop of about 100 RPM or less would be considered acceptable. Flood coolant is acceptable but high pressure coolant is a bonus. The wheel must not be allowed to load-up. This grinding tool may create sparks when in use. Use standard safety precautions when using this product. Check the VOC of the cutting fluid that you are using and/or consult with the coolant manufacturer for correct application. (Lower VOC is better.) Cutting fluids with a high VOC can contribute to unsafe operation including the risk of fire. 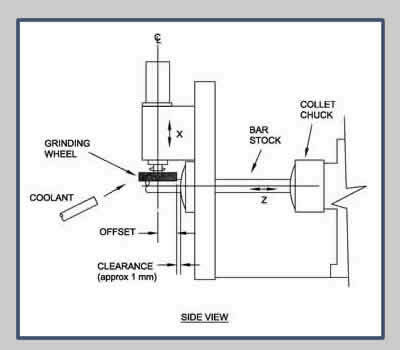 How to Select the Proper Diameter Grinding Wheel for Your Machine Tool . . . The drawing at the left shows the top view of a tool block for a typical swiss screw machine. The clearance is the distance from the face of the guide bushing to the front edge of the tuming tool, typically about 1 mm. The offset is the distance measured in the Z direction from the face of the front turning tool to the centerline of the live tool. This information for your particular machine can be found in the operation manual that came with your machine tool. Your programmer will also know this value since he typically will use it in his computer program to move the stock face from the tuming position outward to the milling/drilling position. This dimension is generally referred to as the Z axis workshift with a typical G-code as follows: G50 W-.591. This code would move the face of the stock out to the live tool centerline an amount equal to .591 inches (15mm). The diameter of the wheel that is required for a machine with a .591 (15 mm) offset would be equal to this dimension multiplied by 2. So, a grinding wheel with a 1.182 inch diameter (30 mm) is the correct size for this application. The drawing to the right shows a side view of the grinding wheel installed in a typical swiss screw machine. The clearance and offset are shown to further clarify the application. The offset multipied by 2 gives the correct wheel diameter for your application. 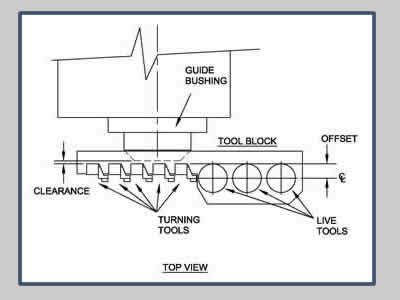 How to Select the Proper Diameter Shank for Your Machine Tool . . . Always select the largest shank diameter for your machine tool. Most machines will accept either ER-11 or ER-16 collets. If the live tool on your machine tool utilizes the ER-11 collet, then select the 7 mm shank diameter for your application. Likewise, if your machine tool utilizes an ER-16 collet, then select the 10 mm shank diameter. IF YOU DO NOT SEE A TOOL WITH THE CORRECT DIMENSIONS FOR YOUR MACHINE, PLEASE CONTACT US AND WE WILL BE HAPPY TO SUPPLY A TOOL FOR YOUR APPLICATION. WE WILL NEED TO KNOW THE OFFSET DIMENSION AND THE TYPE OF COLLET THAT YOUR MACHINE TOOL UTILIZES.